An aerostat is tethered along the border as the sun sets behind it on Friday, April 20, 2018, in La Joya, Texas. 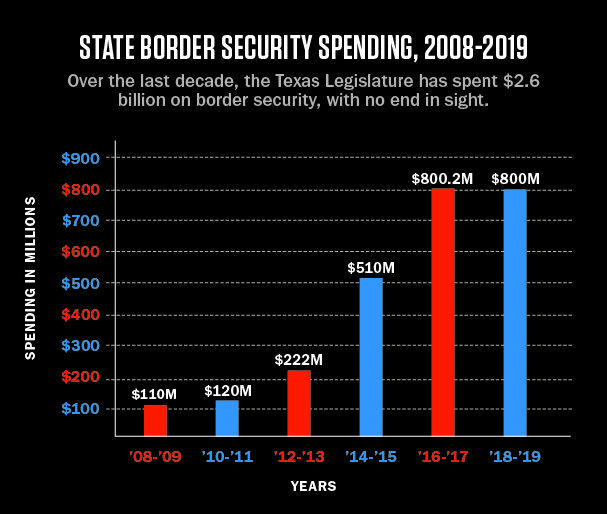 Though the federal government runs a multibillion-dollar border security operation, Texas has spent $2.6 billion on border security of its own. Texas has deployed special-ops teams, armored gunboats, and two high-tech spy planes that criss-cross the state. Flight data indicates the $15 million spy planes have surveilled one border town at least 357 times and may have traveled multiple times into Mexican territory. 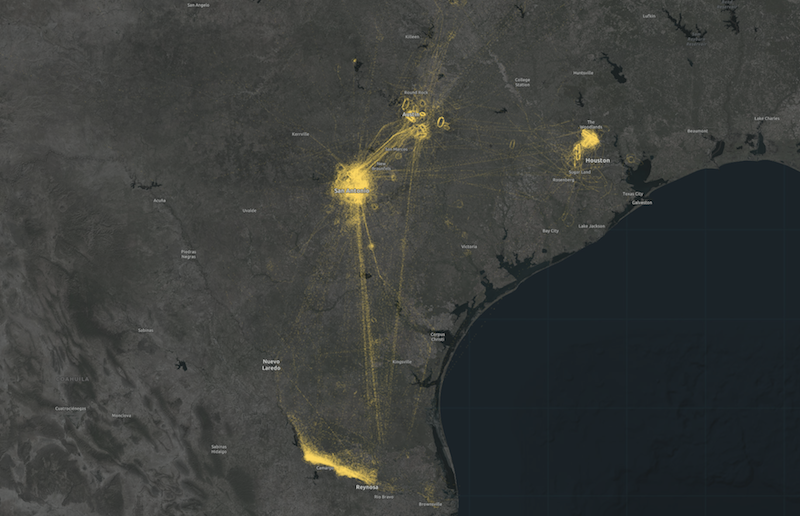 Many border towns in the Rio Grande Valley are among the most surveilled locations in the nation, despite having some of the nation's lowest crime rates. The National Butterfly Center sprawls across 100 acres, bordering the Rio Grande in Hidalgo County. 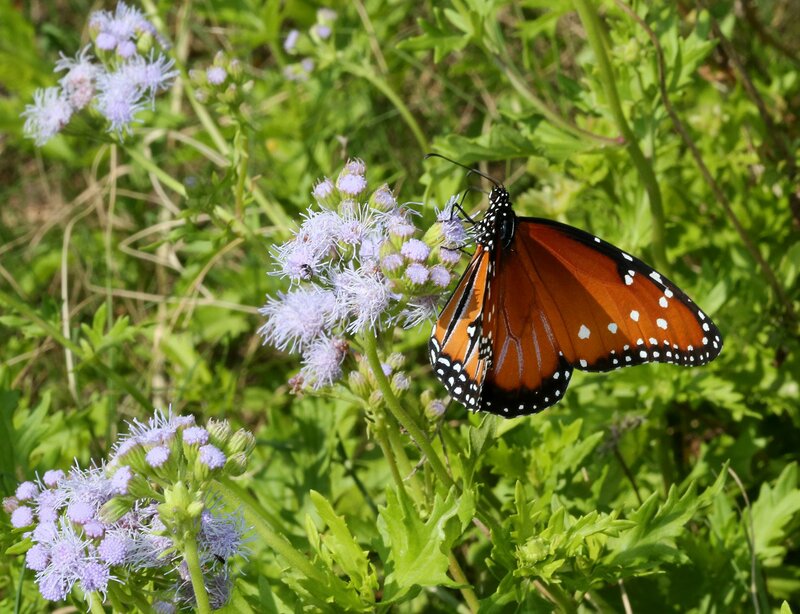 The land sits on the migration route for the threatened monarch and dozens of other species that pass through the area every fall on their way to Mexico. For more than a decade, the center has also been inside the zone of one DPS border security operation after another, as state leaders have converted the state police agency into Texas’ own Department of Homeland Security. Once devoted primarily to enforcing statewide traffic laws and conducting criminal investigations, over the past decade DPS has received billions in taxpayer dollars to invest in special-ops teams, armored gunboats, spy planes and other military equipment to patrol the Texas-Mexico border. The federal government already runs a multibillion-dollar border security operation that has grown over that same time period to include new fences and walls, thousands of additional border agents, surveillance towers, ground sensors and drones. Despite the federal buildup, Governor Rick Perry, facing a competitive re-election campaign in 2006, refashioned himself as a tough-on-the-border candidate, promising to line the Rio Grande with surveillance cameras so that ordinary citizens serving as “virtual Texas deputies” could report the smuggling of people and drugs in real time on the web. After winning the election, Perry doled out $4 million in federal funds to his Texas Virtual Border Watch program. (The Texas Tribune later reported that only 29 cameras had been installed by 2010, netting just 26 arrests at a whopping cost of $153,800 each.) Despite criticism in the media and from Democrats, Perry embraced his border-hawk role, depicting the borderlands as a war zone in need of a tough-talking governor to hold back the chaos and the cartels. That strategy helped Perry build his national profile for his first bid for the White House in 2012. Standing at a podium in front of a two-star general from the Texas National Guard and DPS Director Steve McCraw, Perry said he would “not stand idly by while our citizens are under assault.” When a reporter at the press conference pointed out that elected officials from the border disagreed with his depiction of their communities as unsafe, Perry scoffed at him. In fact, Texas’ border counties have had some of the lowest crime rates in the nation for years, according to FBI Uniform Crime Reports. Yet, nearly four years later, Texas taxpayers have spent more than $2 billion on Operation Strong Safety and its successor under Governor Greg Abbott, Operation Secure Texas. But the success of these expensive operations in curtailing smuggling and other border-related crimes is a subject of dispute. The operations have exacted other costs, too. Hidalgo and Starr counties are now among the most profiled and surveilled communities in America, with residents forced to adjust to life under the persistent watch of aerostat surveillance balloons, observation towers, National Guard listening posts, drones, DPS surveillance cameras, DPS spy planes and a barrage of intrusive police stops. Over the course of several months, I interviewed dozens of residents and elected officials in both counties. They all described an unprecedented border security buildup that has taken a toll on their civil liberties and, ironically, made them feel far less safe. The two counties have also been targeted by the Trump administration as the site of the first new segments of border wall. Far from being rural, the Rio Grande Valley is one of the fastest-growing metropolitan areas in the state, with a dynamic economy and a relatively low crime rate. So why is the region so heavily policed? And why won’t state leaders listen to border communities when they say they’ve had enough? Click here to read about DPS’ aerial surveillance program and to view an interactive map with flight data. We reached Military Highway and turned west, passing fields of beets and citrus groves as we neared Butterfly Park Drive and the center’s angular, modern, light-filled visitors pavilion. 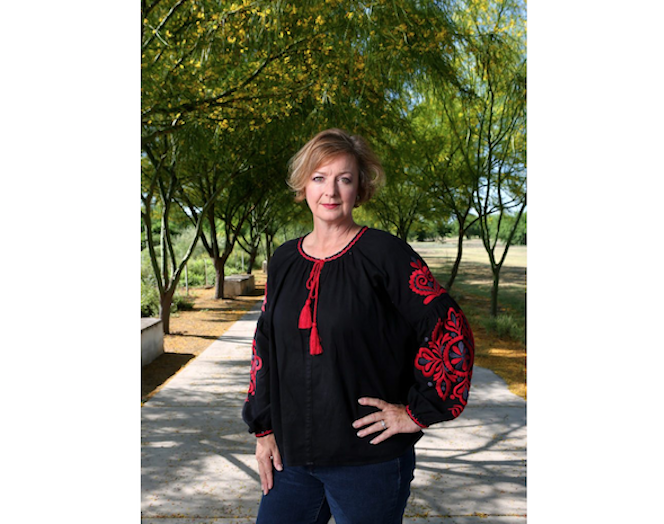 It was a Saturday, but Treviño-Wright was dressed for work in high-heeled boots, a long skirt, a white sweater and a colorful embroidered Guatemalan butterfly necklace. Earlier in the day, she’d volunteered as a judge for a local high school’s essay contest, the theme being, naturally, butterflies and the importance of conservation. Every year, more green space near the butterfly center is plowed under to make way for shopping malls and residential developments. Soon, Treviño-Wright said, a cross-border shipping facility will be built not far from the sanctuary. On the east side of the center’s property line, a reservoir is under construction to accommodate the new growth. National Butterfly Center Executive Director Marianna Treviño-Wright under retama trees at the center. The elderly Hispanic gentleman, who had been placed at the butterfly center through an AARP back-to-work program, was unnerved by the experience, Treviño-Wright said, and found a job elsewhere. 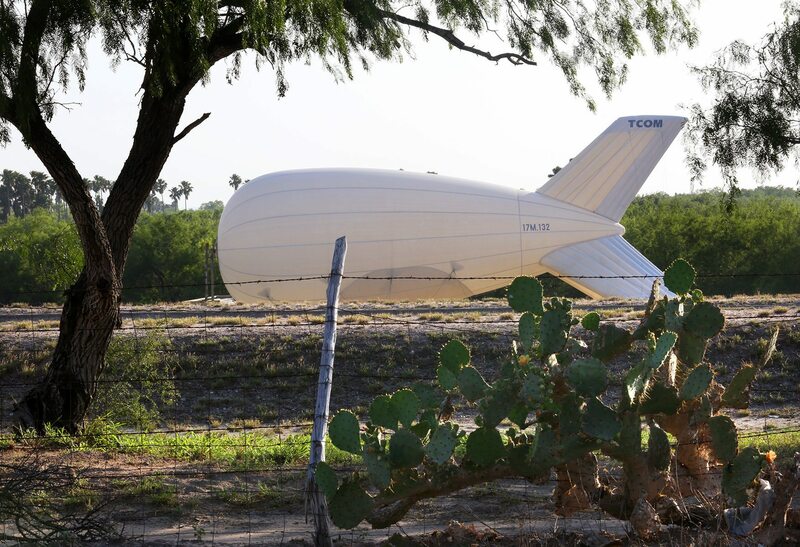 Farther west were the large, white aerostat surveillance balloons, first used by the military in Iraq and Afghanistan and now repurposed for border security in Texas. 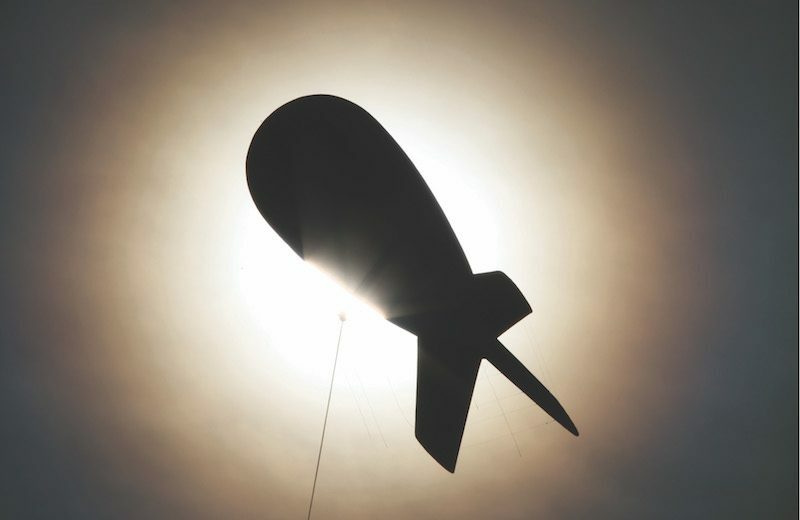 Operated by the Department of Homeland Security, each balloon costs around $950 per hour to operate, and any time the wind kicks up, they must be grounded to avoid calamity. Three years ago, one of the balloons broke loose from its tether, hit a power line and then crashed in a farmer’s field. At the moment, however, Treviño-Wright was less concerned about rogue balloons than about a surveillance camera that one of her staff had recently found in a tree on their property. The off-the-shelf game camera was camouflaged with brown bark from the tree. Other than that, it was unmarked, and they had no idea which agency it belonged to. “When we looked at the camera footage, it was just hours and hours of the irrigation canal and the tall grass waving in the breeze,” she said. “We called Border Patrol and asked if it belonged to them, but they said that it didn’t.” Treviño-Wright said she’d never been approached by any state or federal agency about placing cameras inside the sanctuary. Most likely, the camera was part of DPS’ Operation Drawbridge, another multimillion-dollar surveillance program developed after Perry’s Texas Virtual Border Watch ended. Operation Drawbridge began in 2012, and since then DPS has placed off-the-shelf cameras throughout the Texas border region to combat “criminal activity,” according to the agency. In an April 2018 report — the most current made public — the agency reported that it operates 4,300 such cameras. More recently, in January, a rancher filed a trespassing lawsuit against the Border Patrol after finding one of the hidden cameras on his ranch north of Laredo. According to DPS reports, the agency often works with the National Guard or the Border Patrol to place the cameras in undisclosed locations along the border. The federal Immigration and Nationality Act gives Border Patrol, unlike DPS, legal authority to enter any private property — though not actual homes — within 25 miles of an international border without a warrant. When we arrived at the butterfly center, Treviño-Wright showed me the surveillance camera, encased in hard plastic and about half the size of a lunchbox. Her director of operations, Max Muñoz, offered to take me down by the irrigation canal where they had found it. We hopped into one of the center’s ATVs and bumped along dirt pathways lined with native plants and butterfly gardens, past the large enclosure that held Spike, an 11-year-old African spurred tortoise. Muñoz parked near a large gate, then fiddled with a lock until the metal gate swung open. He pointed up at a tall hackberry overlooking the irrigation canal, a remnant from a time when the sanctuary property was nothing but onion fields. The fallow fields had been painstakingly restored to a native habitat for more than 200 species of butterflies. Left: National Butterfly Center's Max Muñoz points to a faint handwritten number found on a motion-activated camera that was discovered in a tree on the center's property. Right: Muñoz points to the spot where he found a motion-activated camera overlooking the property. The center’s land is divided by an earthen levee; the staff calls the 70 acres south of the levee the Back 70, a portion of which borders the Rio Grande. Muñoz said the center has always been cooperative with Border Patrol, and agents drive the property near the river daily looking for undocumented crossers. Since the agency hadn’t claimed the camera, center staffers had decided to repurpose it to make nature videos for children visiting the center. “I like to show them all of the animals that come here at night,” Muñoz said. He’s recorded bobcats, javelinas and raccoons. As we got back into the ATV, Muñoz told me that the center’s tranquility had saved him during a personal crisis. “I had a business. I had a lot of big clients and was doing really well,” he said. “But I was stressed out, angry at everything and everyone and weighed about 300 pounds. My wife said, ‘Why don’t you start walking. You’ll feel better.’” So Muñoz started riding his bike to the center and meandering along its paths. “It felt so peaceful here,” he said. “Eventually, I lost the weight, lost my anger and decided this was where I wanted to spend my days.” So he volunteered to help plant trees and do whatever else needed to be done around the property. When the director of operations job came up eight years ago, he eagerly applied. “This place changed my life,” Muñoz said. But now it felt like the tranquility he’d found was as threatened as the monarch. Muñoz said he’d been pulled over and questioned by DPS, often when he was driving his children to school or to the store, or when going to work. Under the surge, state troopers, Texas game wardens and Texas Rangers are dispatched from around the state to work 12- to 14-hour shifts at the border for seven consecutive days before rotating back to their home posts. These rotations have saturated the area with state law enforcement. Since Muñoz lives just off Military Highway, where many of the troopers circulate in their black-and-white patrol cars, he had come to expect frequent encounters with them. It was hard to see how the surge was having an impact on cartel-related crime, or deterring smuggling, as DPS claimed it would. Border Patrol and DPS armored gunboats were already plying the river, so the troopers spent the majority of their time parked along Expressway 83, a major thoroughfare in the Rio Grande Valley, or on Military Highway to the south, issuing warnings and traffic citations. Austin TV station KXAN reviewed all of DPS’ border surge arrests from June 2014 to September 2016 — 31,786 violations in total — and found that just 6 percent were for felony drug possession. Even fewer arrests — 1 percent — were related to human smuggling. The vast majority were for drunk driving or misdemeanor drug possession. It seemed the surge had simply concentrated routine highway enforcement functions along the border, while enforcement dwindled in the rest of the state. 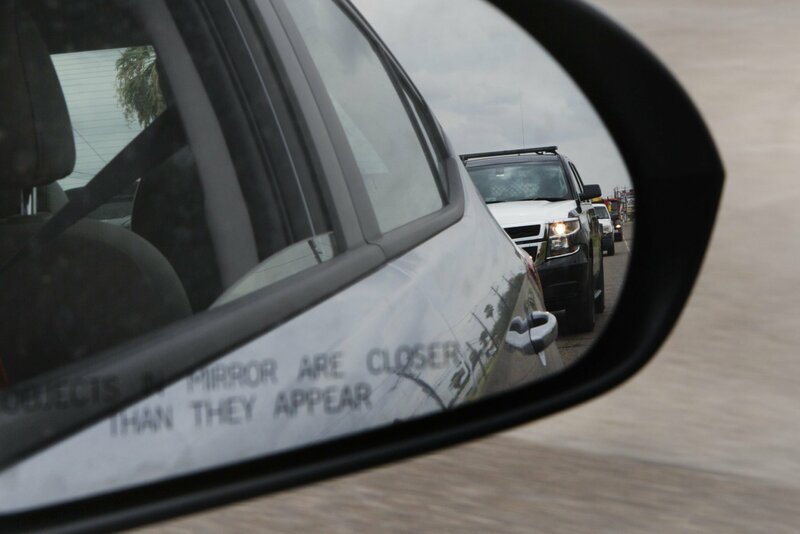 In November 2016, the Dallas Morning News reported that traffic citations had risen by 30 percent and warnings by 160 percent in Starr and Hidalgo counties, while in the rest of the state both had fallen by more than 20 percent. 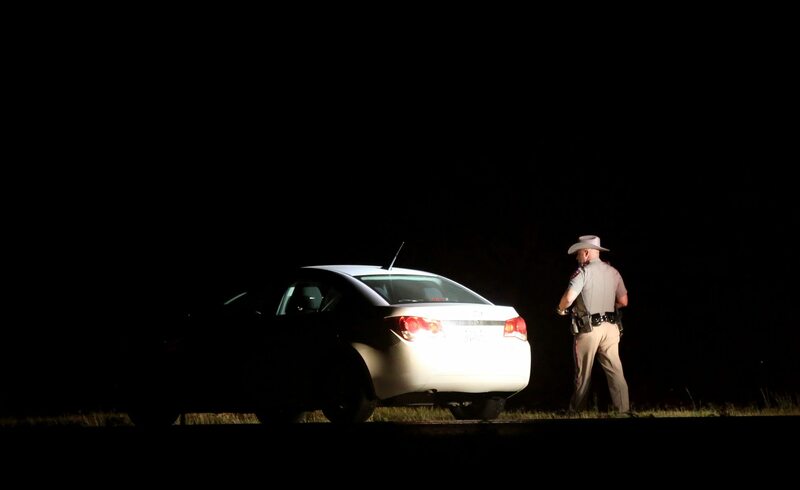 A Texas DPS trooper approaches the passenger side of a car after pulling it over on U.S. 83, near La Joya. The center has voluntarily provided both DPS and Border Patrol with the makes and models of employees’ vehicles, but staff are still frequently stopped and questioned. In the last year, Treviño-Wright said, Border Patrol agents have tried to prevent employees and visitors from entering the center’s land south of the levee. Staff and visitors have been stopped and interrogated several times and told to leave, she said, even though the center’s property is private. One day, Muñoz said, he took his two young daughters and his nursery manager across the levee in his truck so they could prepare an area to be planted by a group of schoolchildren who were coming to visit the next day. They ended up surrounded by four Border Patrol vehicles and a helicopter. With his crew cut and conservative dark suit and tie, Steve McCraw still looks like the FBI special agent he once was, before being appointed director of DPS by then-Governor Rick Perry in 2009. He oversaw the agency’s homeland security transformation while Perry rose to national prominence as a cowboy-boot-wearing, tough-on-the-border Texan. McCraw played a crucial role in building the governor’s image, whether by providing a DPS helicopter to ferry Perry and Fox News host Greta Van Susteren around the border in 2011 in the lead-up to Perry’s first presidential bid, or deploying Texas Rangers to surround Perry at press conferences and photo ops. McCraw has extended similar courtesies to Governor Abbott and Lieutenant Governor Dan Patrick, both ardent border hawks. The state’s ever-growing border-security mission now comprises nearly half of the DPS budget; McCraw’s tenure has been marked by his zeal for that mission and his willingness to take abuse without complaint when legislators are unhappy with the results. At 64, he’s become so accustomed to testifying before the Legislature that when elected officials screw up his last name, calling him McGraw — as in country singer Tim McGraw — he doesn’t even blink. McCraw just smiles stoically, as he did at a House Homeland Security and Public Safety Committee hearing I attended one humid September afternoon in 2016 in Brownsville. Nevarez, a border Democrat who represents a chunk of Southwest and West Texas that includes Maverick County, had been grilling McCraw for close to an hour as the DPS director tried to convince the room, crowded with skeptical border residents, that the state hadn’t wasted billions on the surge. McCraw had come armed with a PowerPoint packed with maps, color-coded bar charts and data to make his argument that the surge was working and should be expanded. McCraw didn’t elaborate. But like the Border Patrol, DPS counts asylum-seekingCentral American migrants who turn themselves in at the border as “illegal immigrant apprehensions,” which allowed McCraw to claim in his presentation that the surge counties had the highest apprehension numbers in the nation. Flashing another slide, McCraw said drug seizures were down nearly 29 percent in Hidalgo County and 27 percent in Starr County, which proved progress. But the state’s other 12 border counties, including Nevarez’s district, were still “unsecured” or were under “minimal control,” he said. Saturating Hidalgo and Starr with troopers, McCraw admitted, hadn’t stopped drug smuggling. It had merely “displaced” it into surrounding counties. The height of success, according to McCraw, would be to have the entire Texas border at green status, or “substantial control.” According to another slide, that would require a permanent stationing of personnel up and down the 1,254-mile Texas-Mexico border. After two hours, McCraw wrapped up his testimony and sat down, looking tired and tense. At the first break, he left. And for the remaining four hours of the hearing, local law enforcement and border residents complained about the surge. Bill Gravell, a justice of the peace in Williamson County — 370 miles from Brownsville — said he was there to testify on behalf of justices of the peace across Texas, who saw firsthand the hidden costs of the surge. 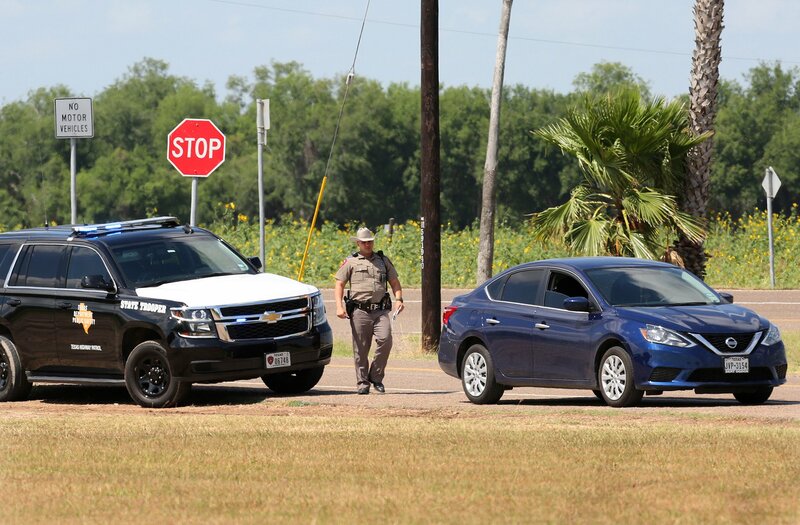 A Texas DPS trooper pulls over a car on Inspiration Road and Military Highway, near the National Butterfly Center. Four months later, legislators convened at the Capitol for the 85th legislative session. State agencies were asked to cut their budgets by 4 percent. Lawmakers slashed Medicaid funding by $2 billion and declined to fully fund the state’s child-welfare system, which has been in crisis for years. In the decade since the surge began, the state’s portion of funding for public education has dropped from 48 to 38 percent. But the Republican majority gave DPS another $800 million for border security. “Texas will not flinch in our resolve to keep Texans safe,” Abbott declared in his State of the State address. In August of 2017, I drove from the city of La Joya in western Hidalgo County to Rio Grande City in Starr County on Expressway 83, counting the black-and-white DPS squad cars along the way. By the time I arrived at County Judge Eloy Vera’s office in Rio Grande City, I’d counted 12 — a DPS trooper every 2 miles. At least half of them were handing out citations or pulling somebody over, slowing traffic to an excruciating crawl. Vera didn’t mince words when I asked what he thought about the DPS border surge in his county. “I don’t like it,” he said. “I think it’s ineffective, and I think it’s inefficient. And I think we’re being treated completely different from the rest of the state.” When the DPS surge came to Starr County, traffic citations soared, he said, while elsewhere they’d decreased. 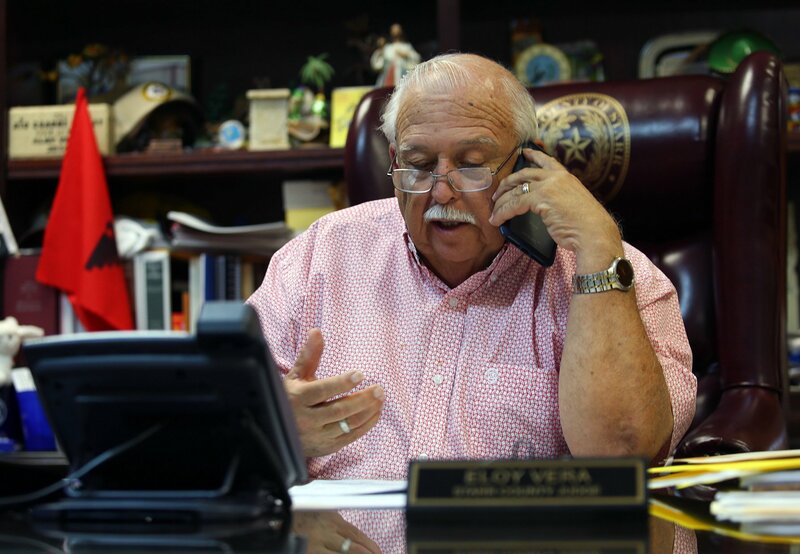 Starr County Judge Eloy Vera on the phone in his office in Rio Grande City. The county judge himself had been stopped six times by DPS because he has a grill on the front of his Ford pickup that blocks a small portion of his license plate. For Vera, being pulled over is an inconvenience. But for many of the county’s residents, living paycheck to paycheck or fearing deportation, the stops can lead to life-shattering experiences. An aerostat grounded in La Joya due to windy conditions. In 2015, one of the balloons broke loose from its tether and hit a power line, then crashed near an elementary school in La Joya. But the border, which is majority Hispanic and majority Democratic, has little political sway in Austin. It’s been a long time since Vera first took office and Texas was a two-party state. Back then, Republican Governor George W. Bush was kissing babies in El Paso and sprinkling Spanish among his West Texas folksisms to court border voters. Bush and other state leaders spoke proudly of the border as a free-trade powerhouse. Now, the only time Abbott or Patrick visited was for campaign photo ops in bulletproof vests. Vera said it was difficult to counter the constant bombardment of war-zone imagery in campaign ads. Rodriguez had to appear at a courthouse 50 miles from her home. When she got there, the judge told her if she didn’t pay the citation he’d have to issue a warrant for her arrest. (The judge ended up lowering the fine to $100 once she paid her car insurance.) “He told me that since DPS had come the jails were overflowing,” she said. “Everyone is spending a lot of time in court.” The day we spoke, Rodriguez said her mother had just returned from court over a speeding ticket. A familiar view for residents in Starr and Hidalgo counties. The heavy DPS presence has also affected her garage-sale business. “If I sell an item online to someone in McAllen, they don’t want to drive over here to pick it up because they’re afraid they’ll be pulled over,” she said. Just a few days before my visit with Rodriguez, Lieutenant Governor Dan Patrick, who has branded himself a “border champion,” debuted a splashy commercial for his re-election campaign featuring DPS helicopters, gunboats on the Rio Grande and Patrick boasting of the billions of taxpayer dollars he’d helped direct to border security. At any rate, he’s mostly prosecuted “a lot of marijuana cases,” he said. In fact, much of DPS’ border drug seizures are of marijuana, which is smuggled across the river because of its bulk. Cocaine and heroin are brought across the international bridges, tucked inside some of the millions of trucks and cars that cross every year — some of them knowingly waved through by corrupt border agents. A May 2015 investigation by the Austin American-Statesman found that DPS was responsible for less than 10 percent of the drug seizures it reported. The rest had been caught by other law enforcement agencies, most often the Border Patrol. And even these seizures likely pose a far lesser threat to the cartels’ marijuana trade than the wave of marijuana legalization, now comprising nine states and Washington, D.C., with 20 additional states sanctioning pot use for medical purposes. A helicopter hovers near a home in La Joya. 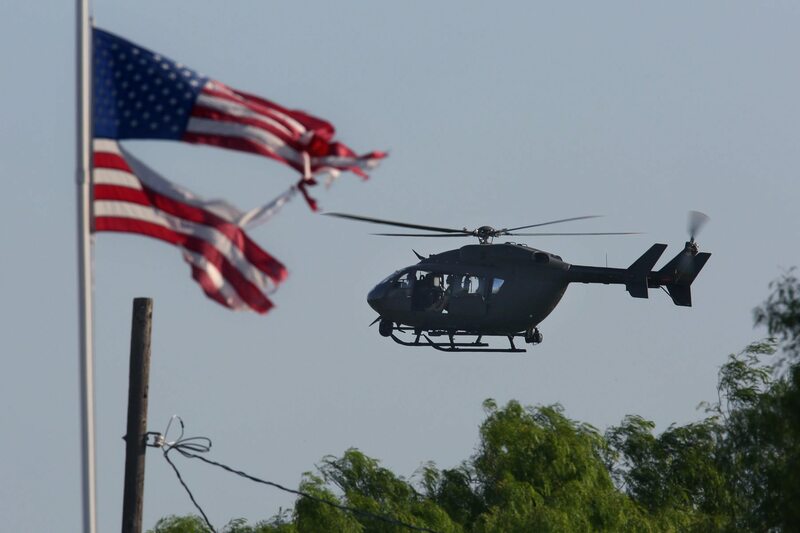 The helicopter patrol is part of the latest deployment of Texas Army National Guard to the border. I asked Escobar about one of the most controversial tactics employed by DPS during the surge — the Cortina Units, in which Border Patrol and DPS pair up in the same vehicle on patrol. The program began in the summer of 2016 with little fanfare, and Escobar said he was aware that it involved “a working agreement of some kind” in which “DPS would ride along with Border Patrol.” Even with the passage of the anti-sanctuary city legislation, Senate Bill 4, last year, state highway troopers are still prohibited from detaining immigrants. If they stop a driver they suspect is undocumented, they call for Border Patrol. The Cortina Units allow state troopers to ride along with Border Patrol so they can “handle violations of state law,” DPS explained in a written statement to the Observer. State violations can include smaller amounts of marijuana that federal prosecutors decline to prosecute, or assaults against border agents. At the 2016 hearing I attended in Brownsville, DPS Director McCraw briefly mentioned the Cortina Units, saying that troopers carry a handheld device that alerts them any time one of the Border Patrol sensors buried along the Rio Grande is triggered. “All of our patrol units, even if on the ground in the weeds working with their partner in the Border Patrol with our Cortina Units, has a mobile device that can track those sensors. We can track our boats, we can track our aircraft,” he told legislators. In November, the attorney general ruled that DPS could withhold every single document regarding the Cortina Units. Only after several months of requests for comment did DPS finally issue a written statement saying, “DPS officers do not independently enforce provisions of the Immigration and Nationality Act regulating the removal of individuals unlawfully present in the United States. DPS officers do have the authority and responsibility to cooperate with our federal law enforcement partners, including federal immigration officers. This cooperation occurs in a variety of ways including the referral of individuals who have been stopped and detained under state law, as well as providing assistance to federal immigration officers.” Border Patrol declined to comment on the units and referred all questions to DPS. “He said, ‘Hey, you didn’t want to come out and play?’"
As in Starr County, many of the 4,000 or so residents of La Joya are struggling to make a living below the poverty line. The town is majority Hispanic and sits just 2 miles north of the Rio Grande. Since 2009, it has been the target of multiple state-led border-security operations. It’s easy to spot La Joya while driving west on Expressway 83 from McAllen because of the large, white aerostat surveillance balloon that hovers overhead. On the outskirts, black-and-white DPS squad cars and SUVs are as ubiquitous as utility poles. An aerostat conducts surveillance above the city of La Joya. 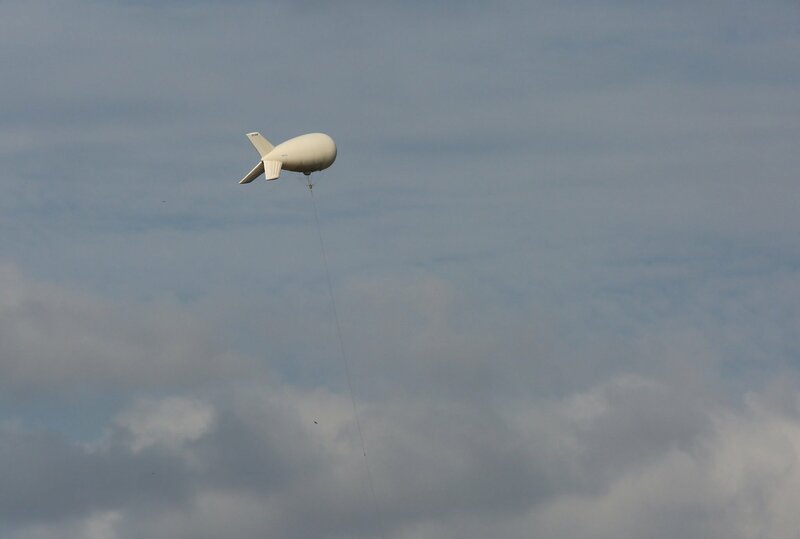 The Department of Homeland Security operates several surveillance balloons along the Texas-Mexico border. Mayor Salinas met with me in the city hall, a small, wood-paneled office behind the police station, in a downtown made up mostly of fast-food restaurants and a few shops. It was July 2017, and Salinas sounded a lot like Vera and Treviño-Wright when he said he thought the surge had harmed his community. “People are afraid to go out, people are moving away,” he said. The baseball game stopped and the catcher left the field to attend to his wife and son. Scared families started to leave in droves. Mayor Salinas and his daughter Frances were outraged by the heavy-handedness of the encounter at an event that was supposed to bring the community together. Frances began recording on her cell phone, catching much of the interrogation before filming the undocumented woman and her 5-year-old son being taken away by Border Patrol. The video, later uploaded to YouTube, dominated the local news for several days. After speaking with the mayor, I drove to the baseball field, which was empty. As I stood near the pitcher’s mound, a DPS trooper in an SUV passed by slowly on Military Highway, observing me. I imagined that the DPS surveillance camera that had sent DPS and Border Patrol scrambling to the game was still there, hidden in the brush. I walked toward the bushes and thought about searching for it, maybe waving to the bored analyst watching from some airless control room. But after the trooper made a U-turn and came back around, I decided to leave. Left: David Iturbe, left, and Arnulfo Gonzalez play soccer at the sports complex in La Joya. In 2016, a DPS camera was found hidden in the brush near the complex. Right: DPS driving by the sports complex in La Joya. I found the woman who had been detained and her young son in a battered trailer in a neighboring town. She told me Border Patrol had held them overnight in a cold cell, but then released them. The mayor and other local elected officials had complained to the local Border Patrol chief about the aggressive display, and Border Patrol had let them go home the next afternoon. The woman, whose name is Sandra, said she had come to Texas seeking safety for her two children, fleeing the cartel violence that was consuming her town in Mexico. But now, after the incident at the baseball field, she was afraid to leave her trailer. “When they put us in the patrol car, I was crying and my son was crying,” she said. “And your son?” I asked. He stood nearby, listening, but staring intently at the ground. How did he process what had happened, I wondered? Back at the national butterfly center in mission, I asked Marianna Treviño-Wright whether DPS had ever responded to the formal grievance she had filed with headquarters in Austin. “I was actually very impressed with their response,” she said. A DPS investigator was assigned to look into the complaints of harassment and racial profiling. But it turned out the troopers who had harassed her employees had not documented the interactions, so the DPS investigator had nothing to go on, she said. A queen butterfly at the center. I asked whether she could have ever imagined that the modest butterfly sanctuary would be at the center of a border-security juggernaut. Since then, dozens of politicians had come and gone, each one promising more military hardware, more “boots on the ground,” more “border surges.” But what stayed with her most, she said, was the vulnerability of the women and children whom these politicians claimed America needed to be protected from at all costs, even if it meant constant harassment and a 30-foot wall. With additional reporting from G.W. Schulz, a journalist of 15 years covering security and criminal justice issues.